Desiree potatoes are pink-coloured potatoes. Their skin is very thin and doesn't need any peeling. I like eating desiree potatoes when they roasted with their skin on. Fleur de sel, also known as flower of salt in French contains more mineral complexity than table salt. I like to use Fleur de sel for this bake; although soft, this salt topping stays on my bread very well, look like little "snow flakes" on my bread. Due to its soft and moist texture, the fleur de sel on this loaf doesn't has the typical coarse sea salt crunch at all and its saltiness would simply melt into my mouth. I'm always very proud of my homegrown herbs and think our rosemary and olive herb plants are always fabulous... Olive herb is an interesting herb to use for cooking and baking. It is a hardy perennial with bright green leaves that have an intense olive flavours. ... these are simply the reasons that I love baking this bread. With or without breadmaker, the bread seems not difficult at all to bake and yet so soft and flavoursome to eat. After running and baking so much lately, I'm actually feeling quite tired and all I want now is a holiday... My family and I will be having a short break in Singapore and Shanghai for the next coming 3 weeks and hope that our "guardian" mother hen can watched our plants well when we are gone. I hope to return soon with lots of running, cooking and baking. See ya. My son reckons that this "mother hen" is me... LOL! Place the flour, yeast, salt and rosemary in a large bowl and mix well. Make a well in the centre of the mixture. Combine the water and 3 tbsp of the oil and add to the dry ingredients. Use a wooden spoon to stir until combined, then use your hands to bring the dough together. Turn the dough onto a lightly oiled surface and knead in 1 tbsp of remaining oil. Knead for 10 min or until smooth and elastic. Brush a large bowl with oil to grease. Place the dough in the bowl and turn to coat with oil. Cover with a clean tea towel and place in a warm, draught-free place to prove for 45 min or until the dough doubles in size. (Instead of kneading by hand, I've placed all my ingredients into my bread-maker and use "dough" setting to knead and prove the dough for 1 hr). Preheat oven to 220°C (or 200°C fan forced). Without knocking back (deflating) the dough, place in a 15 x 27cm (base measurement) non-stick loaf pan (mine is 15 x 26 cm). Cut the potatoes, crossways, into thin slices and place in a large bowl. Drizzle with the remaining oil and toss to coat. Use a small, sharp knife to cut 20 evenly spaced slits, about 2cm deep and 2cm long, in the top of the dough. 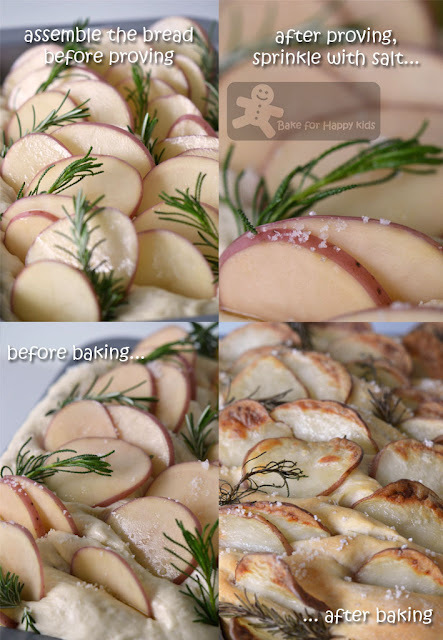 Insert 1 slice of potato in each and insert a rosemary sprig in the dough between the potato slices. Cover with a tea towel and place in a warm, draught-free place to prove for 1 hr or until the dough doubles in size again. Sprinkle the top of the dough with sea salt and bake in a preheated oven for 40 mins or until light brown and hollow-sounding when tapped on the base. Remove from oven, turn onto a wire rack and set aside for 10 min to cool. Serve warm or at room temperature. Note: Mine was baked for 20 min at 200°C fan forced and another 20 min at 180°C fan forced. 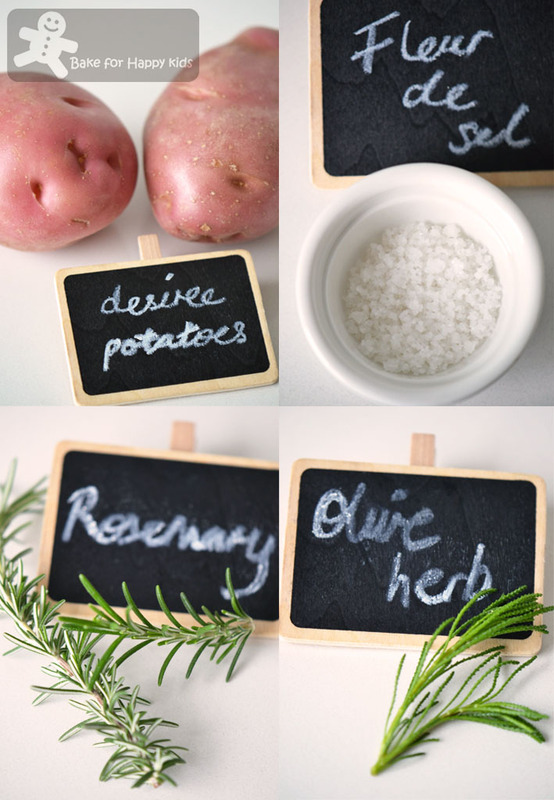 Love this, I am very much fan of freshly baked bread,combo or rose mary potato, Fleur de sel makes awesome. Glad you are able to run and complete the marathon. I can just imagine the wonderful aroma of this bread! Reminds me of those italian cafes during my uni days in adelaide...nostalgia. I have a packet of rosemary in the fridge, was just thinking of what to do with them, hate to see them go to waste. This is perfect timing! I will use my breadmaker too since i am no good at kneding dough :p thanks Fr sharing this Zoe, and congrats on your marathon! Hve a well deserved break. Hi Zoe, congrats on finishing up the marathon! Well done! Love your herb garden, it's so beautiful. I wish I had something like that in Singapore too. congratulations on your achievement on your marathon!i know how much hardwork and effort you have put in for these and so happy for you! so while you were running, did you also think of me and joyce back here?? LOL! anyway, congratulations! the red skin potatoes, i didnt know their names, i just call them red potatoes, we have it here..i think it's the same variety looking at the photo. Im sure this is a flavourful bread. yum! have a good break and enjoy your holidays!! Beautiful herbs you got there, we recently started a herb garden too, and I'm hoping they will thrive in our weather. Fingers crossed! WOW, Impressive time on your marathon! CONGRATS! 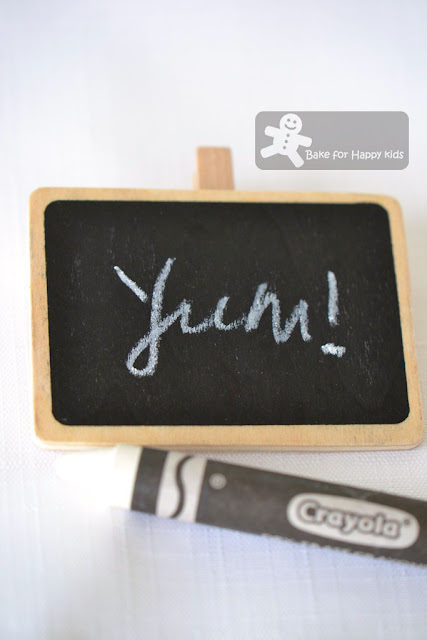 Your bread is gorgeous too, and I love your little chalkboard clips:) You have many talents! Haha, I agree with that last picture. Just YUM! I wanted to thank you for a beautiful comment on my blog. I really appreciate your efforts,and that too when you have such a busy schedule, you have taken to bake the danish bread. Mwaaaaaah!! "Caught" your kiss! Thanks Anuja! Super women? I think I'm more likely to be tired woman now... Now that I have stopped baking for just the last 5 days... my hands are getting "itchy"... LOL! A big Mwaaaaaah to you too! Will miss you gals! Zoe, you ran the marathon! Good on you, girl! I find that rosemary before cooking has this terrible overpowering smell but once cooked, wow it is really fragrant. I would imagine your rosemary potato bread smells incredible and is so good to eat. Have a great holiday with your family and see you soon! Hi Zoe, my rosemary bread is being proved for round 2 as i am typing now! Just wondering whether i can do a short cut of the process. Like after taking the dough out of the breadmaker (not prove yet), can i straightaway put it into the loaf pan and prove for 2 hours, then insert the potatoes and rosemary, and straightaway bake? Do you think it will work this way? I would reckon that you need to insert the potatoes and rosemary before the second prove. 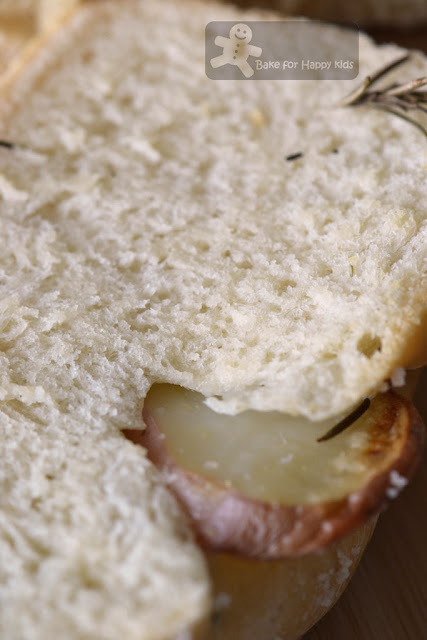 Otherwise, the insertion of potato and rosemary will deflate the bread resulting a less soft and fluffy texture. This recipe is really good and I reckon that you don't have to wait for the second prove for too long. Maybe the method might work like what you said but I still prefer this traditional way of baking bread... Please let me know if this works for you as I'm interested to know. Zoe, this bread is so guuuud! I wasnt sure of the timing so i accidentally overbaked it, hence resulting in a thick and very hard crust all around the bread :(. Bt the inner parts are very moist and fluffy, and the potatoes sort of melt in my mouth. Wonderful! Since this is my first time making this, i made half the quantity and finished half the loaf myself :p. can't resist it. The next time i make it, i will make the whole thing in my breadmaker as a loaf of bread. Thanks again for this lovely recipe. Happy that you like this recipe! Like what you said, the bread is very soft and moist inside and best of all, this recipe is so straight forward and easy to bake. CLAP! CLAP! Hooray! You did it! You completed the marathon! Well done, Zoe! Congratulations! All the hardwork and efforts paid off, your family must be pretty proud of you! Phew, when I think about 42km, almost pengsan!! Your bread looks good, love your rosemary plants, have not heard of olive herb plant, will google for it! You deserve a break! Have a great holiday! Have fun and enjoy! Thanks Joyce! I have been thinking of you, Lena, all my friends and my family while I was running... I was feeling so much pain that even music can't get into my ears. Only the enduring thoughts kept me going. Thank you so much again for your support! A big clap for our Zoe for being able to finish the line! You have made yourself proud! Love this rosemary & potato bread, so much of fillings! Your marathon time is amazing - I did a 10 miler a couple of years ago in 1hr 40 - positively craling compared to you (and I haven't run since - it totally did me in!) I hope you enjoy your break. This bread looks wonderful. Awwwww ! Congrats , Zoe ! I can't even run for more than 10 minutes ! lol Anyway , I just love your herbs ! My 3rd pot of mint just died :( , I only bought it for about a week tsk tsk #black thumb :P :D ..... Your potato bread looks delicious ! The generous slices of red potatoes as a topping and of course , the fresh herbs looks really good ! I love rosemary and I grow 2 big pots of the herbs at home too. But my leaves are thicker and never flower... I can smell your bread from here.... Thumbs up! This is a very interesting looking bread, can imagine how heavenly it would smell :) Congrats on completing the marathon! What a great treatment of the recipe. Your photography inspires me! I love baking bread more than anything even cakes although I have a huge sweet tooth, I'm on the lookout for new recipes. Bookmarked yours and hopefully will try it soon. That looks delicious! Almost like a very fancy pizza. And, congrats on the marathon! I love baking some bread!!!! Your's looks absolutely beautiful! Marathon? This is mission impossible for me. Lol! Only exercise I do is shopping. Gosh, your bake is so tempting! I could almost smell the rosemary from here! I wish I could run a marathon. I struggle running a bath. on the plus side this recipe looks glorious! who ho that is so brilliant. luv ur clicks dear. Congratulations on your marathon Zoe! I know from people who've done this here how exhilarating an experience it is! The rosemary gives this bread a very special touch! Congratulations on your marathon Ms Zoe! I look forward to try this recipe. Thank you. Congratulations on your feat!! Loved this recipe..a must try soon one!! YAY!!!! Congratualtions on your first marathon. Can you believe you did it already? You totally beat my best time. You're so fast! Have a great vacation. You deserve it! 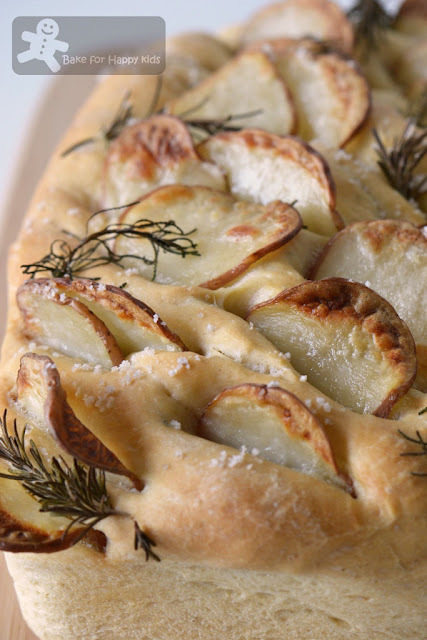 And I love this bread, potato and rosemary are such winners! Oh, this bread looks fantastic! Potatoes and rosemary are such a great combination. Wow, congrats on your marathon, Zoe! I've done a couple of half marathons...and they were killers! So I'm quite impressed!!! And thanks for sharing such a unique and wonderful bread...I could eat a whole loaf myself! Have a wonderful weekend, my friend. Hi Zoe, congrats on finishing your marathon. Have a nice and enjoyable holiday. Zoe, you are so amazing. Running 3hrs 54min 56sec...that is so awesome. Rosemary and potato bread sound so special to me. i never bake with herb before other then pizza..hehe I think i will love this bread. Would like to know what is Italian 00 flour?.. :) because i saw you used this flour for some of your bakes. Italian 00 flour is a very finely milled flour that can vary in its gluten content. The one that I used is about 10% gluten and I reckon its finely milled properties has slightly improved my bread texture. Great looking bread! My wife has been doing a ton of bread baking lately, but hasn't made any with potato - I'll have to show this to her. Congrats on the marathon, and have a great holday. Congratulations on your run. Enjoy your holiday, the bread looks fantastic. Hi Zoe! Congratulations on the marathon! That is an amazing time! Isn’t it nice when you find a new passion after kids? I think sometimes when we become moms and loose ourselves into just being a mom. We forget that we have passions and goals that we want to accomplish. I’m so glad that you found some new passions and challenged yourself. You’re a good role model for all moms. You deserve a vacation. Have a wonderful time with your family and I can’t wait to see what you whip up when you return. OMG ZOE! Way to go on the marathon!! You are so amazing!! I have ran several half marathons, but have yet to take the plunge and double the distance. I am very impressed! I hope you have a wonderful time on vacation and do some major relaxing and eating good food. The bread looks absolutely amazing. Great recipe as always! Well done Zoe! After having a baby I rarely have time to do exercise not to say training for marathon, glad to know that you had done it. Living oversea I expose to different type of herbs, but sadly I didn't know how to use them, must learn from u, the Rosemary and potato bread looks so nice! Congrats for making to the finishing line Zoe. This is a really yummy potato bread. Have a wonderful holiday..take care! I hope you did well on your marathon :) As for the bread it looks beautiful and full of flavor...beautiful pictures as always Zoe. Zoe congrats for the marathon! this bread look fantastic!! Congrats on the marathon, Zoe - that's amazing! I really admire driven people like you. The potato bread looks so delicious - I've been meaning to make a potato focaccia forever and you've given me the push I needed to actually make it. This is so timely - we're supposed to have a hard freeze tonight, so we just uprooted our rosemary plant and potted it to bring indoors. The entire kitchen has this great rosemary aroma! And now I'm seeing this recipe. It's fate, I tell you, fate! ;-) Thanks for this. Congratulations on this great achievement,dear Zoe!I have been running for a year and I think it is a great hobby!Marathon sounds so difficult for me...i wish I could make it some day too! Your bread is delicious!I love rosemary! Sorry for not dropping by often.I have no spare time this year! Keep running and keep baking all this yummy stuff! Love and kisses from Greece! Congratulations on running the Melbourne marathon! Amazing. This bread looks seriously good. 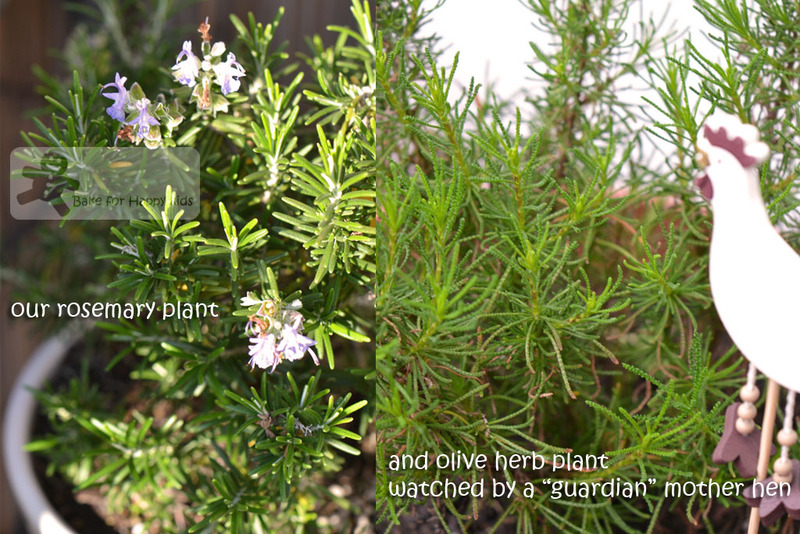 My rosemary has almost taken over our little garden, so I'm always keen to discover new ways to use it. Yum! Wow how impressive training for marathon. This bread is so unique I have never seen anything like it. The potatoes roasted then inserted in the dough how very neat! Rock on with the marathon. That is really very awesome. The rosemary bread looks delicious- a savory, hearty bread for the cooler months. i wish i am able to plant a pot of fresh rosemary at home, tried one time it was failed, look at your pot of rosemary, urge me to try again..I love this type of bread..